With the presence of a large number of leading market players, the ventricular assist device market in North America is characterized by a highly competitive landscape, states Transparency Market Research (TMR). The high degree of competition can be attributed to the fact that patent expiry of one vendor creates opportunities for other companies. Several market players have been trying to extend their presence in emerging economies. For instance, Voltas Limited has been planning to enter the Middle East via participation in international events such as Qatar Olympics in 2022 and the World Expo in Dubai to be held in 2020. During 2015, the North America ventricular assist device market was pegged at US$0.4 bn, according to the findings of TMR. The market will keep flourishing at a promising CAGR of 9.20% between 2016 and 2024, achieving a revenue worth US$1.07 bn by the end of 2024. The U.S. is likely to represent a larger share in the ventricular assist device market in North America compared to Canada. Greater number of device approvals, along with the rapid advancement of science and technology, particularly in the treatment of heart failure, have been driving the market for ventricular assist devices in the U.S. This regional segment is expected to continue to hold its dominance throughout the forecast period as well, owing to higher awareness about these devices amongst patients and healthcare providers. By indication, the destination therapy (DT) segment is expected to emerge as the leading segment of the ventricular assist device market in North America. This can be attributed to the declining number of heart donors and the increasing use of total abdominal hysterectomy (TAH). The rising incidence of heart failure amongst the population of North America is a primary growth driver of the market. The American Heart Association found that nearly 16% of the population in the U.S. die from stroke, while a massive 68% of the population above the age of 65 suffering from diabetes die from heart disease. As the most common cause of heart failure is left ventricular dysfunction, leading to congestive heart failure, more number of patients are likely to opt for ventricular assist devices. Fewer number of heart donors and increasing demand for heart transplants have also been promoting the growth of the market for ventricular assist devices in North America. Moreover, the various awareness campaigns initiated by organizations such as St. Jude Medical are creating awareness about the enhanced quality of life resulting from ventricular assist devices among the patient population. 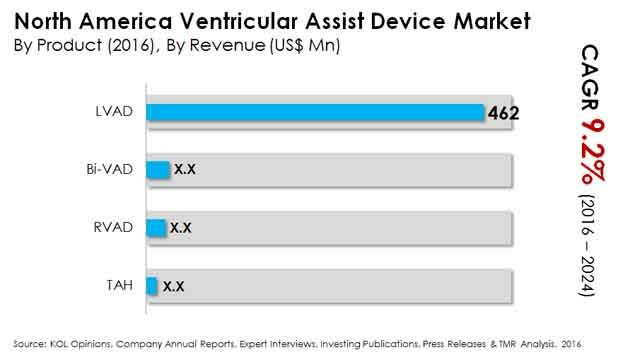 On the contrary, the high costs of these treatments and the possibility of device malfunction can impede the growth of the market for ventricular assist devices in North America. However, the development of advanced products such as magnetic levitation can ensure steady growth of the market.